The Dakota Stealth is a brown leather watch that is durable enough to wear any and everyday. This is packaged in a deluxe leather storage box. 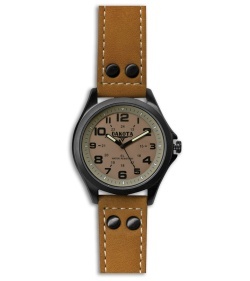 Stealth is made up of a black stainless steel casing with a brown leather wrist strap. Also includes: khaki E.L. Military dial, moonglow Electro Luminescent dial light, Luminova hands and hour markers, a second hand and is 165 ft. water resistant.